On Wednesday the 31st of August Will Robinson, Will Eefting, Kate Saunders and I together with Mr. Laurie Burt and Mrs. Tracey Walsh made the trip to Canberra to visit Parliament and meet with our local member Cathy McGowan. Canberra was an amazing and truly unforgettable experience. The trip gave us the opportunity to talk to our local member and discuss issues, which were of concern to us and local youth in our area, such as the impact laws have on us because we live near the border of two states where laws differ. As well as this we got an insight into the politics of our country and what Cathy’s role involves which I feel is extremely important as I turned eighteen this year and am now able to vote. It was also really interesting to learn about the architecture and history of parliament house and attend question time. Attending the war memorial for the last post ceremony was another incredible and moving experience and a reminder of the sacrifices many have made for our country. I would like thank all those involved in organising the trip particularly Mr. Burt and Mrs. Walsh. It was great experience and something I will never forget. 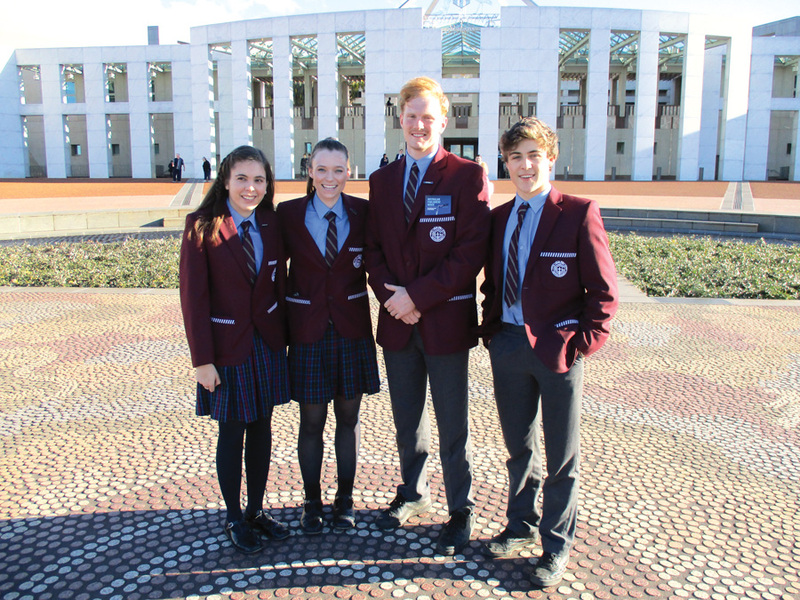 On the 31st/1st of August/September, our Leaders of Galen Catholic College endured on the long trip to Canberra to spend time with our Local Member for Indi, Ms Cathy McGowan. Chloe, Kate, Will and I were accompanied by our greatly appreciated staff of Laurie Burt and Tracey Walsh, and we also acknowledge the work done by Galen in making the trip possible. During Day 1 in Parliament, the six of us experienced some quarreling that went down in the Lower House as many issues were addressed by both parties. This better assisted me to understand Politics, as well as understand the situations and procedures that are tackled by Local Members and Ms McGowan, which also helped me to appreciate the work done by Members of their electorates. We met Cathy post Questions time, and from there we learned a lot from each other, exchanging what leadership means to us and the actions that need to proceed in order to make a change for the better. From here, I believed that the four of us experienced the type of person Ms McGowan is; a lovely woman that cares, highlighting the reason that she is here to help make the difference to the area. What I appreciated most, was the fact that Cathy wanted to know and find out on any issues in the area, and what could be addressed to make a change, and that she listened to what young people had to say about local challenges. Day 2 in Parliament saw us attend a tour of the building and Parliament House, and later have Lunch with Ms McGowan and her sister, Mim. During Lunch we discussed more into issues involving the area, and started to plan how these changes could be made. After lunch, Cathy made a Statement during the Members 90 Second Statements and included Galen and acknowledged the work that young leaders do in their schools. On behalf of our leaders, I would like to thank Ms McGowan in slotting us into her schedule, as we all gained a lot during the experience and enjoyed our time in Canberra, as well as thanking the work done by Galen to plan this event and the staff who attended. Last week – on the 31st of August and 1st of September – I was lucky enough to travel up to Canberra with Co-captains Will Robinson & Chloe Hancock, and Secretary Kate Saunders, to visit Cathy McGowan, MP, the Federal member for our electorate of Indi. A buzz accompanied the first day of the 45th Parliament as people, including our party of six led by an excited Mr. Laurie Burt and Mrs. Tracey Walsh, queued up to watch Question Time – an hour of raucous and hostile debate in the House of Representatives. Following that, we met with Miss McGowan in her office and had a discussion about the goings of Parliament, leadership and school. Later, we visited the Australian War Memorial and watched a solemn and moving Last Post service – although, it was a shame Laurie wasn’t able to pull some strings to get Chloe to sing the National Anthem. That night, the gang hit up the streets of Canberra to find a place to fill our empty bellies. We chose Sammy’s, a Chinese restaurant, and proceeded to devour a 6 dish feed that proved to be scrumdidiliumptous. After a tight and contested several rounds of ten-pin bowling, we slept like Kings & Queens, until we were woken up from our beauty sleep at 8am the next morning. First order of the day was to head back to Parliament House, where we commenced with a tour of the gorgeous, spectacular and historic structure. At lunch, we met with Cathy again and she invited us to a three-course-meal at the Members Dining Room, and the food was truly succulent and lip-smackingly good. It was an honor to be able to meet Cathy. She is a genuine person who takes an interest in each and every individual – she sincerely cares about people, and the people within her electorate. From her, we learnt a lot about how to approach leadership, how to encourage active participation, how to better ourselves for the future, and how to achieve some of the things we are looking at. Thank you very much, Galen, for the opportunity.